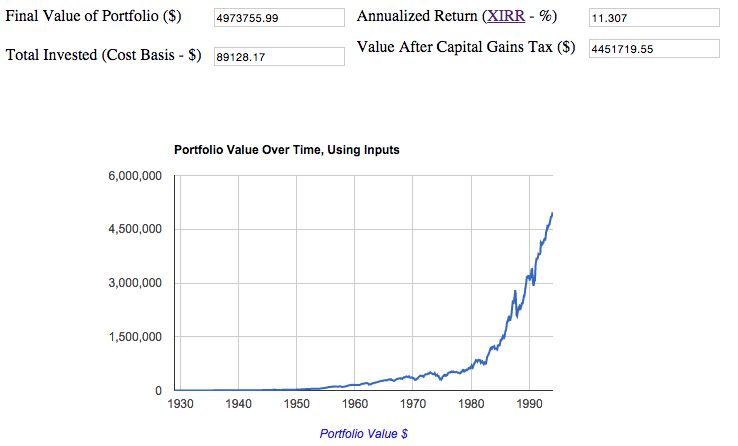 Navigation: Home » Featured » Can You Grow Wealth with Stocks? The Story of Ronald Read. Can we expect folks with average or below average incomes to be able to amass a sufficiently large financial nut in retirement? Or, more simply, is it reasonable to expect to be able to grow wealth with stocks? Financial sites like to stress that good decisions over a sufficiently long time lead to very good results. Applied to your retirement, that means small savings sacrifices over a long career compounded at a reasonable rate means a huge sum at the end. With that stated: just how reliable is that “reasonable rate” assumption? If you want to read the details – read on. Otherwise, skip to the end for the conclusion – we don’t blame you! CNBC shared an awesome investing story about Ronald Read, a Vermont gas station attendant and janitor who passed away at 92 years old with an $8 million estate consisting of dividend paying stocks he purchased over his career. Not only did he amass that huge sum, but he also did it relatively anonymously – he was known as frugal during his lifetime, and a large amount of his estate went to a local library and hospital. By all accounts, he maintained his frugal lifestyle through retirement, and he still retained a number of paper shares of large company stocks in a lock box when he died. Since Mr. Read graduated high school in 1940 and served in the Armed Forces during World War II, that means he likely started investing in 1945 or 1946. And we, with the benefit of 20/20 (or better!) hindsight, know that in terms of valuation the mid-1940s were a particularly fortuitous time (that link is an S&P return calculator) to sink a large amount of money into the stock market. But, the question is: how fortuitous? Jesse Livermore, anonymous financial writer at the site Philosophical Economics, shared his take: there are only a few periods in US history that stocks have returned over 8% annualized (and inflation adjusted) for 65 subsequent years… and one of them roughly started at the mid-point of World War II – 1942-1943. Livermore’s take is excellent, and his math is unimpeachable – his conclusion is that younger workers will not be able to come close to Read’s results by investing if the market remains at its current valuation. 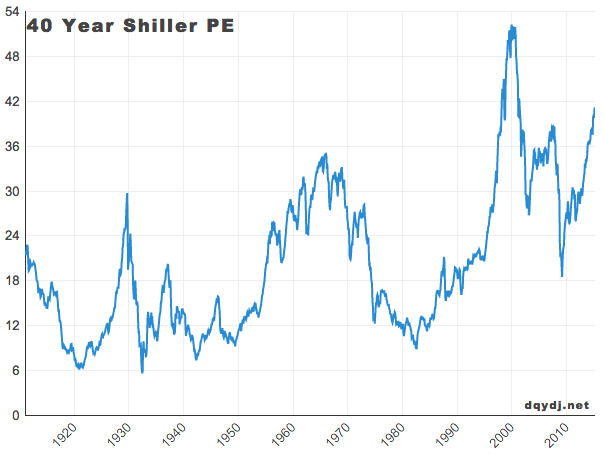 Although his conclusions are probably a bit tongue-in-cheek, the fact remains – if you use the current 10 Year Inflation-Adjusted Price to Earnings ratio (the ‘Shiller PE’, or the ’10 Year CAPE’) and you revalue the stock market using today’s valuations back to when Read started investing, it would take a lot more sacrifice to reach the same results. Let’s set aside Mr. Read for a second – he invested in individual stocks, which (to borrow from another investor, Warren Buffett) can be viewed more as boats which rise with the tide – but have different levels of buoyancy. If that’s a tortured comparison, I’ll say this: we have a calculator which shows dividend reinvested returns for individual stocks, and at least CVS and John Deere have beat the S&P 500 since then. But, what could a typical passive investor in the S&P 500 have done? The CNBC article quotes an advisor saying, roughly, “about $300 a month could have done it”. From February of 1948 to February of 2015, and ignoring taxes and management fees, $53 a month adjusted for inflation (read: $530 a month in February 2015) would give you about $7.95 million dollars. Add taxes on a median income and some guess at a management fee and you’re still in the $4.5 million dollar range. Now, $530 a month is doable for a lot of households in America – note that even a young, single person has access to $18,000 in 401(k) space, $5,500 in IRA space and $3,350 in HSA space for tax free investing in 2015 ($2,237.50 a month before company match) – but it is a bit hard on the average $25,140 janitor’s wage – roughly a 25% gross savings rate, and closer to 30% net, if Paycheck City’s math on that wage in Texas is correct. However, in Livermore’s scenario, where valuation is held constant at roughly a 27.2 Shiller P/E – it quickly becomes out of reach for our theoretical janitor. His math pencils out to $1,831 a month – a sum still doable with tax free space for a young worker of above average means, but undeniably harder to hit… and over an 100% net savings rate for our janitor. Not even the most frugal saver with a coupon counterfeiting machine can pull that rate off. Holding the valuation to a permanently high plateau makes sense extrapolating from the recent past. However, we can reasonably expect (maybe ‘hope’ is the proper word?) that constantly high valuations aren’t the case. While they are excellent for people drawing down their wealth now (the retiree and financially independent set), they are dangerous for people in their 20s-mid 40s, who are still in the relatively early accumulation stage of their career. If they buy all of their stock at a permanently high level, then only huge increases in earnings per share can save us – note that when valuations are high, dividend payouts are, by definition, lower than they would be with lower valuations (and everything else held constant). If valuations are permanently high, it also means there is no need for the equity risk premium to exist anymore. The equity risk premium, roughly, is the idea that its the uncertainty in stock prices which drives the excess returns of stocks over bonds – and leads to the common advice that money you need in the near future is better held in a safer instrument. Second, this assumption means that all market participants would be looking back at the last 10 years to determine current valuation. That leads to some strange results in game theory – both financial chicanery on the part of companies (imagine bad news timing based on the trailing 39 quarters), and market participants defecting and projecting forward instead of backwards… like folks attempt to do today, except with less pressure to get it right, and more margin for error. You can expect the equilibrium wouldn’t last long. With that in mind, I looked at a different 65 year time frame – one where valuations were at a similar level to today: January of 1929 (and we all know what happened 10 months later). It’s our belief that the market may retain a high valuation over some periods – but hey, for the reasons we’ve stated… it probably won’t stay this high for 65+ years. An investor who started investing in January 1929 and held on for 65 years (January 1994), only increasing their monthly contribution with inflation, would have only had to increase their savings rate from $530 a month to a whopping… $575 a month (in 2014 dollars) to hit $5,000,000 in January of 1994 ($8,000,000 in 2014 dollars – using CPI, not S&P returns!). Not to trivialize it, but $45 additional dollars due to bad timing in the markets should be doable with a minimum of frugal behavior. In the parlance of our times, you can probably “cut that out of a cable bill”! Maybe it is possible to grow wealth with stocks – and potentially even huge wealth. And, remember, we’re not really aiming for a specific number for retirement– shoot for the stars, land on the moon… be proud regardless. If you have a janitor’s salary and somehow end up with $2,000,000 in purchasing power (in today’s dollars) instead of $8,000,000? You did well, even if your assumptions didn’t come to pass. Drumroll Please… The Conclusion: Can You Grow Wealth with Stocks? It’s time for some platitudes: for the average American, historically, the best investor strategy has been to bury your head in the sand and dollar cost your way to truly eye-opening returns. If that’s over 65 years, you’ve always seen a positive return – as Livermore notes, somewhere between a 5.5% and 8.5% after inflation return annually (before fees and taxes). Sure, for most of that time the United States has been the global hegemon and has had the most dominant economy as well – but today the S&P 500 is estimated to get only a bit more than half of its revenues from the homeland anyway – so the S&P 500 is somewhat protected from some home-grown slumps (but not global financial contagions, as we are acutely aware!). Even over shorter time frames that’s true – we deliberately picked a very tough period in the NASDAQ for a dollar cost averaging article – and proved that even that horrible timing had acceptable (if not quite hitting the ‘fair’ level) results. So, the news isn’t all good – somewhere between $575 and $1830 a month might be needed (or more… or less, eh? No one can draw those error bars precisely…) over a very long time to match Mr. Read’s performance – and that assumes a personality that can stick with it through thick and thin. Of course, that’s not the full goal – the real goal’s for a comfortable retirement. Even if we don’t see Read-level results in 2080, here’s to hoping some of you look back and thank yourself for starting and sticking with periodic investments way back in 2015. So, yes, you can grow wealth with stocks… but valuation will determine the adjective you attach to that wealth. Fascinating study. I’m bummed that I can’t just save $24 a month and hope for the best, though….. What if I just switched to micro-caps? Maybe you’d match someone doing $30 a month into a large cap fund? Haha – yeah, I don’t think this elevated valuation will stick around forever though. There will be another opportunity when folks are worried that stocks will never produce excess returns again. If you read this full post, you’ll note that Livermore inspired this article – you can find his link just under the 40 year PE chart, along with my discussion of his assumptions.